If you ever think about bringing more of your personal touch in your business, then The Logo Creator will enhance your creativity. The application makes up original logos from beautiful and intuitive colors. Instead of hiring a logo designer, you can create, modify a logo as much as you want. Whereas The Logo Creator has unlimited access to the logo, you must pay something with the designer. To help you have some idea of the logo, there are over 200 logo templates customazible. You also have the possibility to import photos and custom graphics from the web according to your business. So, you can get inspired from other sources. 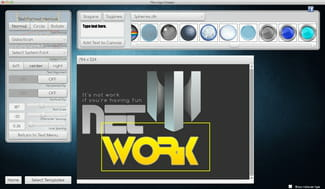 As soon as you installed the Logo Creator, you will have a license to offer highly compelling to your clients. Aart from creating logo, the application can help you create your blog images. The Logo Creator uses clip art images and animated logos which are important for the brand. It has a very intuitive interface. The application is easy to use. If you want to have its full features, you must purchase the software. Latest update on February 13, 2018 at 06:03 AM.